Last week I was poking around the ESRC’s 'Administrative Data Research Network’ and discovered the Charity Commission data download website - containing every annual financial return made by every individual charity in England and Wales since 2007. The data comes in a slightly weird file format that I’d never heard of, but thankfully the NCVO have a very helpful guide and Python code for converting the data into .csv format (which was easy enough to use that I managed to figure out how to run without ever having really used Python). 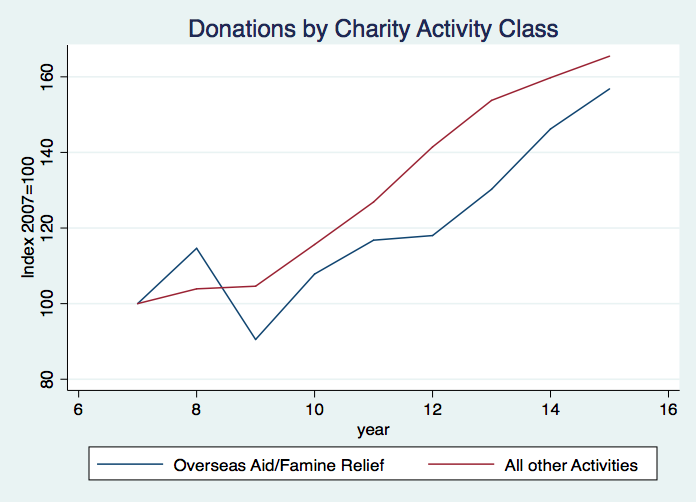 One obvious question you could ask with this data is whether the private income of international charities has dropped as DFID spending has gone up (more than doubled over the same period) - it is conceivable that people might decide that they could give less to international charity as more of their tax money is being distributed by DFID. That does not seem to be the case at all. There are two ways of identifying international charities - by their stated area of operation, or by their stated objective category. I’ve coded charities that have no UK activities as “International”, and also picked out the charities that ticked the box for "Overseas Aid/Famine Relief” as their activity category. These two categories do overlap but far from perfectly. Charities have multiple categories of income - I focus here on the ‘voluntary’ category which basically means all donations, whether large or small. 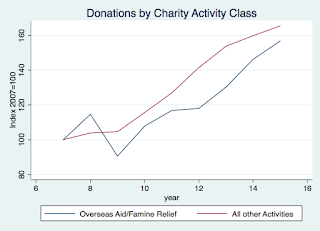 Charities with exclusively international activities, and those focused on 'overseas aid' did appear to take more of a hit than domestic charities from the 2008 global financial crisis and recession, but since then growth has tracked the income of other charities (and is 40-50% higher in 2015 than in 2007 (not adjusting for inflation)). You can download the Stata code here, csv files (large) here, and variable descriptions here.